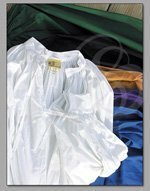 Dauntless Doublet ,Chest Size 44, Jewel Black - this item is in closeout and will no longer be available. This is, without doubt, the coolest doublet that we currently offer. (editor's note: The opinions expressed in this article do not necessarily reflect those of Strongblade. Although it is an awesome doublet and most of us here are planning on getting one!) It's got killer slashed sleeves, an open V-neck and unique, custom designed trims. Let me first start with the custom-designed trim thingee. 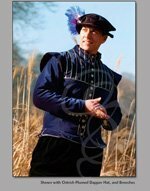 The trim styles available to the seamstress are limitless, so pretty much each doublet has a completely unique trim style -- practically a one-of-a-kind finish. Want to hear more? Glad you asked. Each one of these doublets is handmade by a craftsperson with mad skills. This craftsperson looks at the semi-finished doublet and says, hmmm. This particular doublet is speaking to me. It's saying: I want a fleur de lys trim! And please get your knee off my sleeve.. The craftsperson then reaches into his or her utility shelf and draws out their fleur de lys trim and sews it onto the doublet. The next doublet might have different requests. It might say, hey, I'm feeling a little Celtic! Why not throw a Celtic knot on me? And while you're at it, can you put a string on me and fly me like a kite for a few minutes? . In that case, the seamstress/craftsman would pull out a Celtic knot strip and sew it on (we discourage our craftspeople from flying the doublets like a kite, although the doublets always seem to ask for this). 999 out of 1000 of these doublets will have a different trim style than all the other 998 (The 1000th might have a similar trim to the other 99. I guess you can only hold so much trim in your shelf). Regardless, each of these doublets will come with its own particular trim. Unfortunately, no custom requests are accepted. Your doublet trim will choose you. Now, on to more details about the doublet. It is made from cotton-velveteen, and lined with a soft cotton. 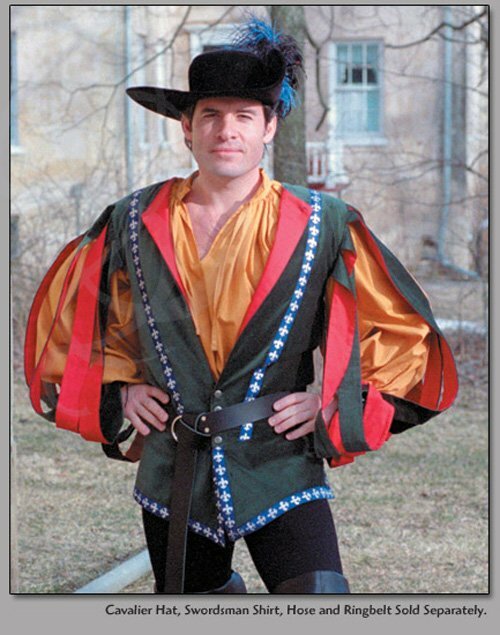 The cut and trim of the doublet gives your shoulder an extra-broad appearance and narrows your waist for that irresistible All women please bow before me look. The long, puffed and slashed sleeves provide the perfect cavalier look, particularly when worn with our swordsman or highcollar gentry shirt. This doublet was based on ones visible in a couple of Carvaggio paintings from the 1500s. For those of you that don't know him, Carvaggio was one of the masters of the naturalist movement (not THAT kind of naturalist) and was absolutely unmatched in his work with light and shadow. He was also quite a character; he killed a man in a three-way duel, was knighted, and had a bounty placed on his head by the Pope himself. Think you can match THAT lifestyle? Then grab this doublet and give it a shot. Materials:Cotton Velveteen. Lined with cotton.